JURY: Mr. Ken Yeang, Ken Yeang Design International, Malaysia/UK; Mr. Ashvinkumar s/o Kantilal; Ong&Ong, Former President of SIA, Singapore; Mr. Silas Chiow, SOM, US; Mr. Sean Hinton, Founder and CEO, Terbish Group, Australia; UIA representative : Ms. Jennifer Lee, OBRA Architects, US. On the southern shore of the Yangtze River, the project is designed as an innovative and fresh solution to the main socio-economic problem in China: the migration of rural population into super cities. This massive rural exodus has created added stress to the already stretched urban resources, resulting in widely reported incidences of overcrowding, pollution and substandard living. The project ? 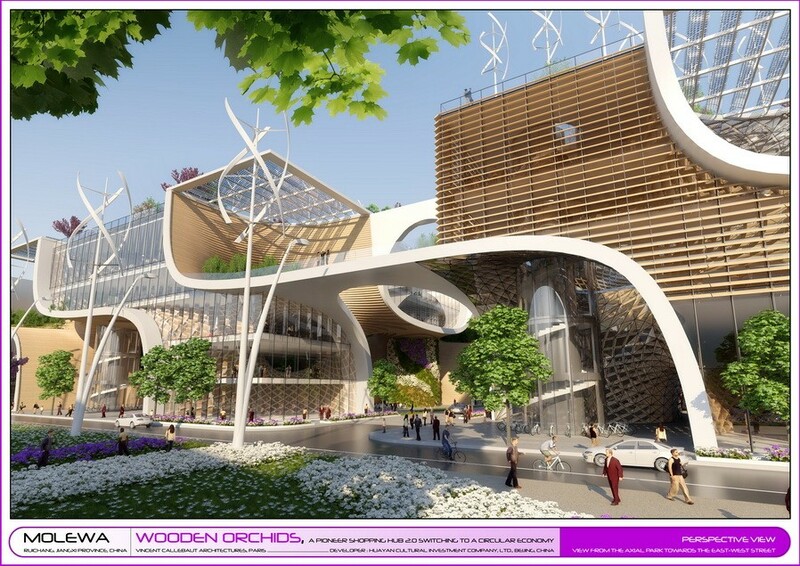 Wooden Orchids ? 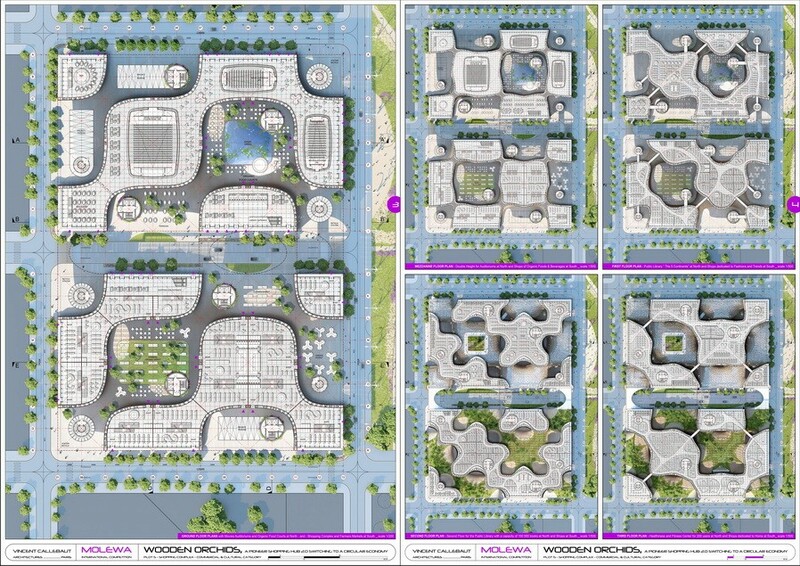 is directly integrated in a new urbanization model called ? 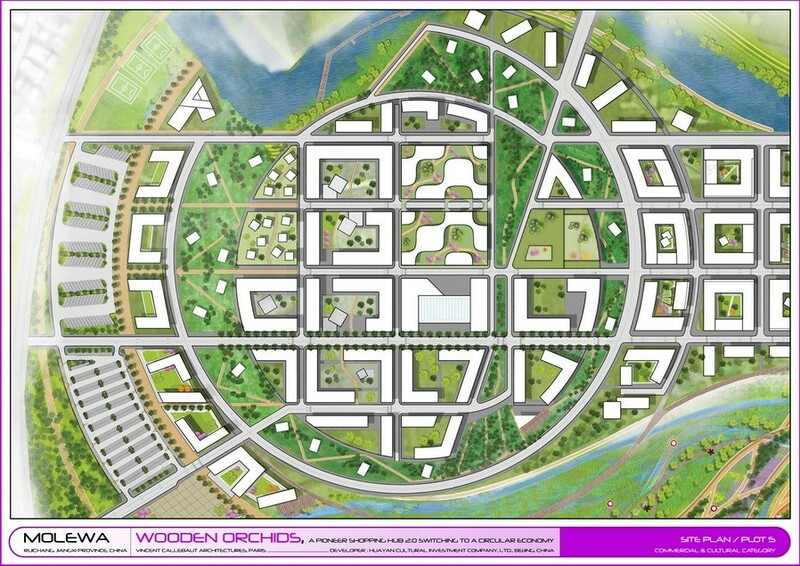 The Flower Ocean / Huayan Township ?, a sustainable and clean master plan based on a strategy aiming at developing existing medium-sized population. Between Mount Lu (a UNESCO World Heritage Site) and Poyang Lake, this sustainable master plan contains a flower-themed park, new sanctuary for China’s classical garden heritage, and Molewa, the central part of the Huayan Township. The objective is to experience new leisure and cultural activities through the enjoyment and celebration of flowers. 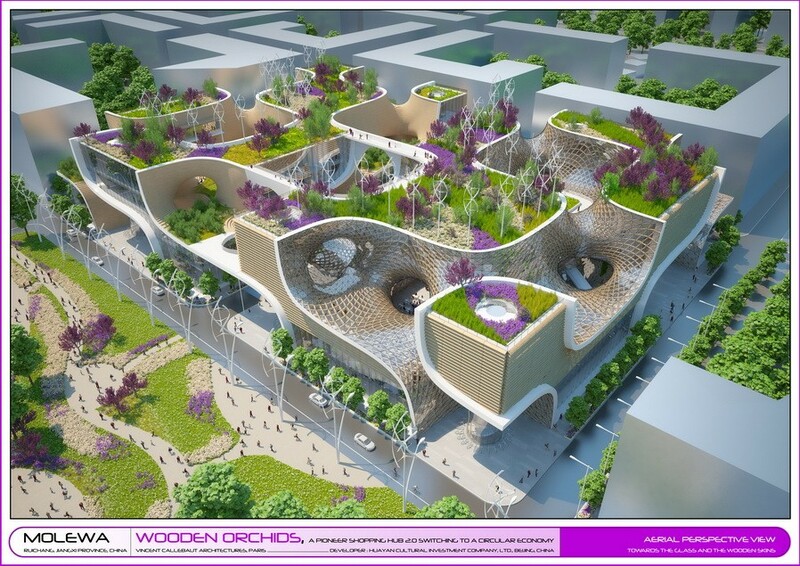 The project is inspired by the organic and spontaneous structure of the nearby Wu Yuan Village (which is one of China’s most well-preserved and architecturally distinguished sites of traditional rural housing). Its architecture strengthens the impressive bio-diversified ecosphere of the Poyang Lake, the China’s largest freshwater lake and bird habitats. 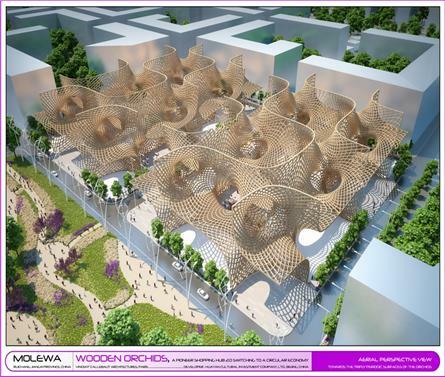 The project wants to create a sense of place that relates to the history, geography and tropical climate of this magnificent area, and in the same time, it aims at alleviating the effects of climatic change by innovative solutions for commercial and cultural uses. The cultural expression is to merge History and Nature in the architectural project in order to create a lasting impression and an emotional resonance on the visitors of this tourist destination. 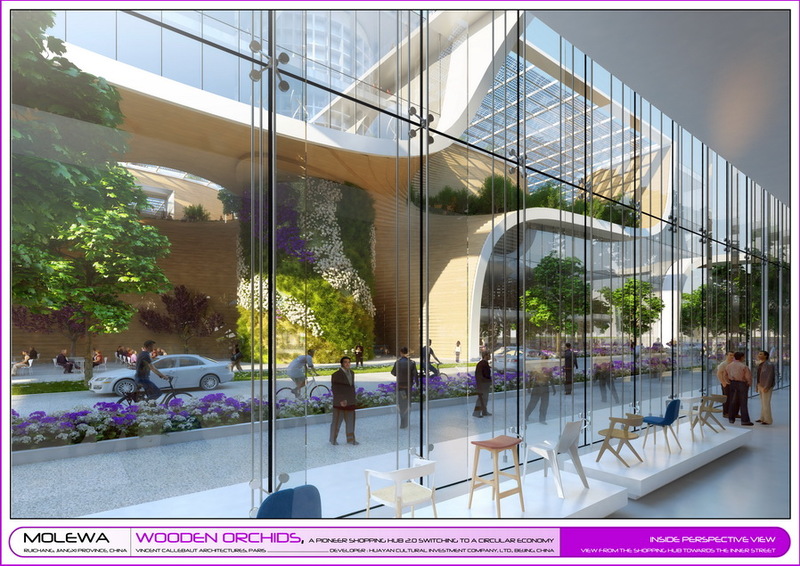 The goal is to promote a “liveable”, connected and development with a vibrant mix of both private and public uses encouraging eco-responsible living, learning, working and serving. The leitmotiv of the ? 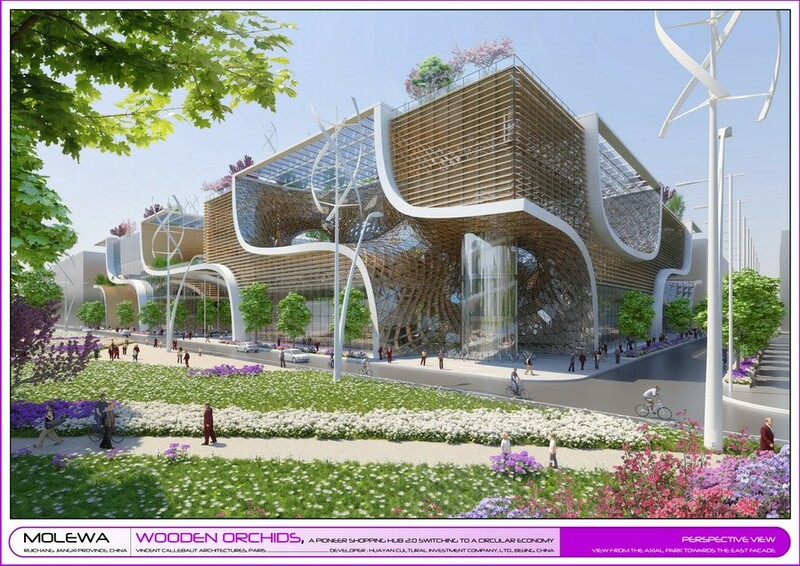 Wooden Orchids ? 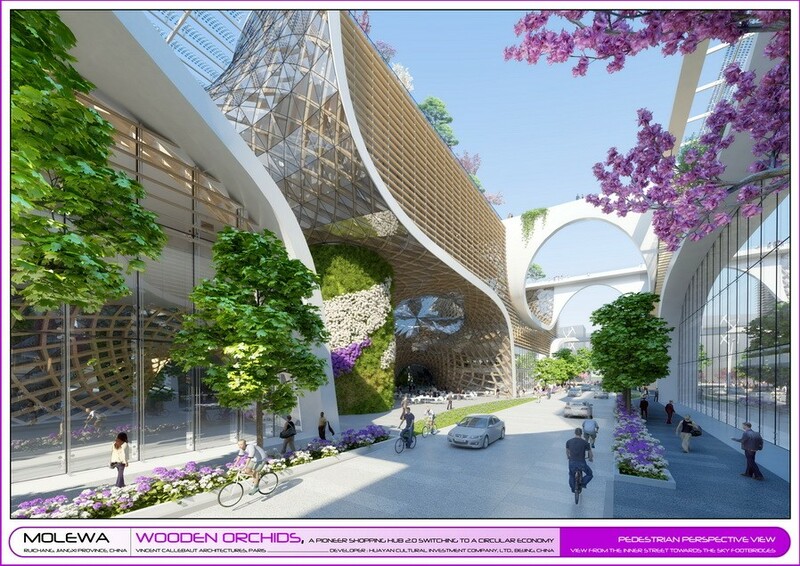 is to transform Molewa into an ecosystem and the shopping complex into a forest of inhabited flowers. This enables energy efficiency that is in full harmony with nature and corresponds to the human desire for a better world. New form, new functions and new mode of use are the key of this new prototype of green shopping complex redesigning complete supply chains for resource efficiency and circularity. The challenge is to assure the transition between the linear economy, which relies exclusively on resource extraction, to a circular economy shifting the focus to reusing, repairing, refurbishing and recycling existing materials and products. Everything used and considered as ? waste ? can be turned into new resource. 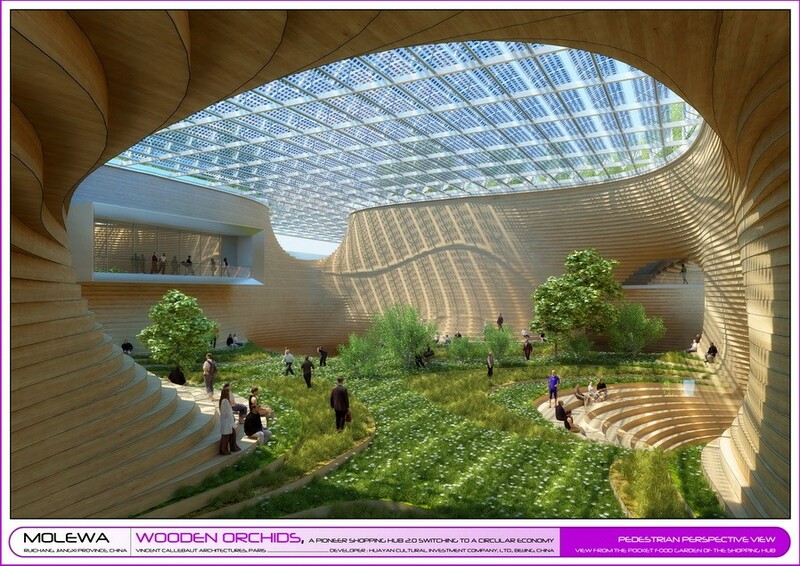 In this new green shopping hub, in alliance with Huayan, a cooperation of local Chinese manufacturers, organic farmers, craftsmen, investors, designers, all of them, committed in the green circular economy and recycling, will be in contact within local and global wider communities. All the products will be intentionally designed to fit into material cycles, and as a result materials flow in a way that keeps the value added for as long as possible – and residual waste will be close to zero. 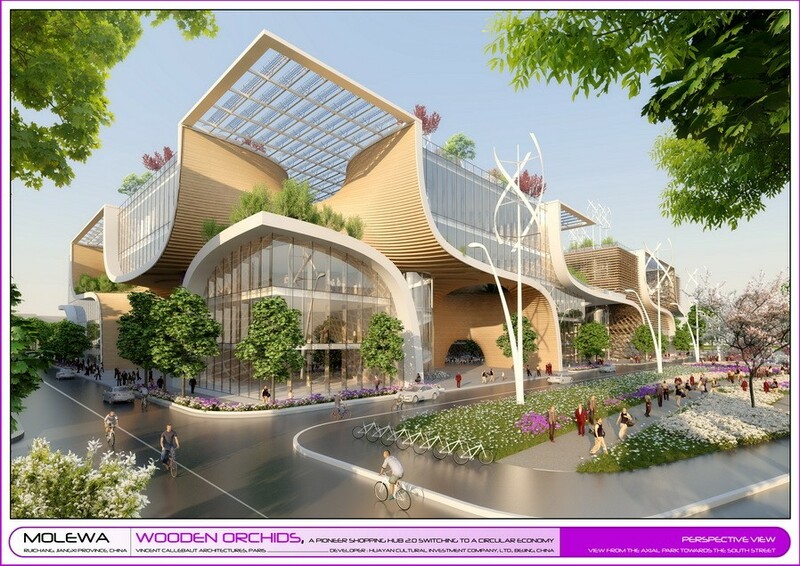 The shopping hub will contain green stores and shops of the alliance committed to offer organic goods and services superior to what is extant in China’s developing cities. As the centre piece of Molewa, the ? 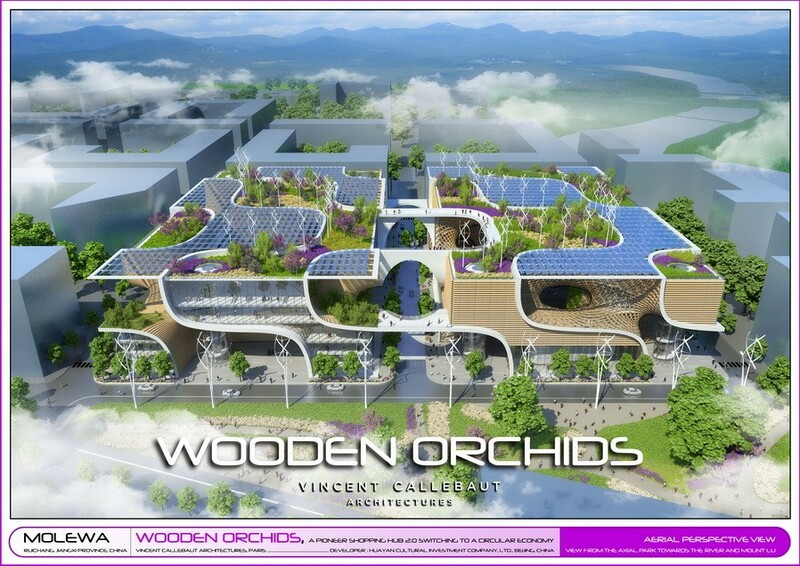 Wooden Orchids ? promotes a new model of fair trade based on high-quality and ecological merchandise with local branding and encourages the e-commerce and the delivery services. 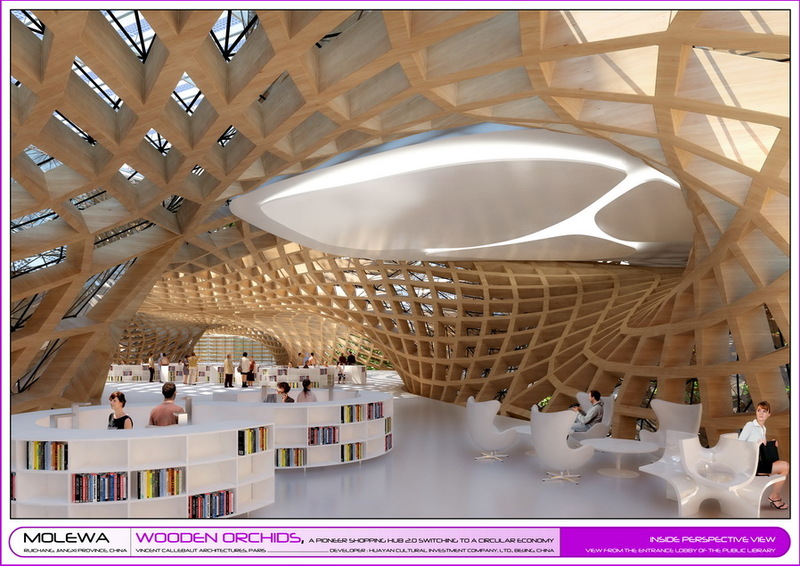 Such as the hub, the architectural project proposes a 2.0 concept store highly connected and creates fluid, progressive and very modular conceptual spaces. Multi-use facilities are integrated considering that the tourist volume fluctuates widely based on seasons or national holidays. The vision for the public realm is to create a new, distinctive, vibrant and high quality sequence of open spaces where tourists, employees, visitors and the local community can work, play and relax. The project strikes the proper balance between formal beauty as a commercial value and practical utility. 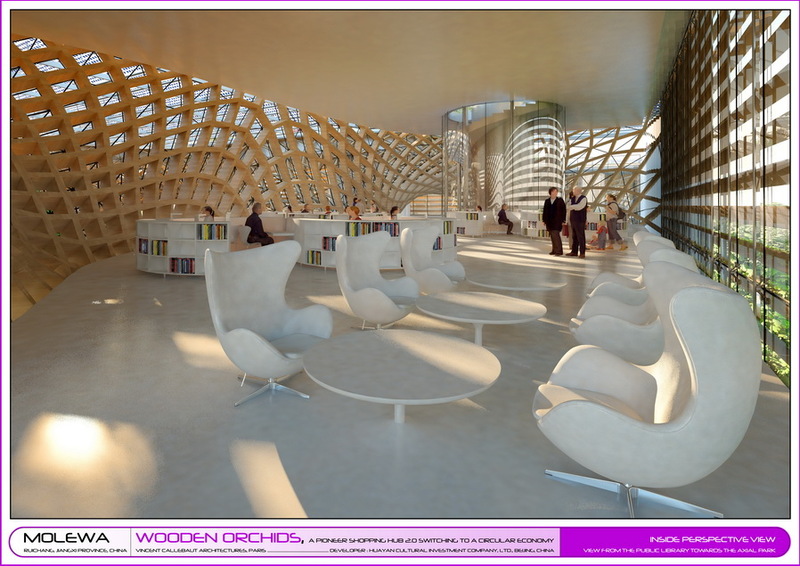 Into the Nature, the shopping hub wants to transform the shopping experience by leveraging digital technologies. Therefore the project offers shops where objects can be customized and 3D printed with digital specialists. With instructive mobile applications, the visitors are also connected to the manufacturers and the famers of the site in order to discover the production methods and the “cradle to cradle” life cycles of food and goods. The two plots of 75m x 120m follow the proportions of the golden section 1: 1.618. Fibonacci numbers are intimately connected with the golden ratio. They also appear in biological settings, such as branching in trees, the arrangement of leaves on a stem, the flowering of sunflowers and the family tree of a honey bee. This natural order has informed the hierarchy, sequence and flow of spaces and places. The ? flower theme ? is the key design consideration for Molewa. 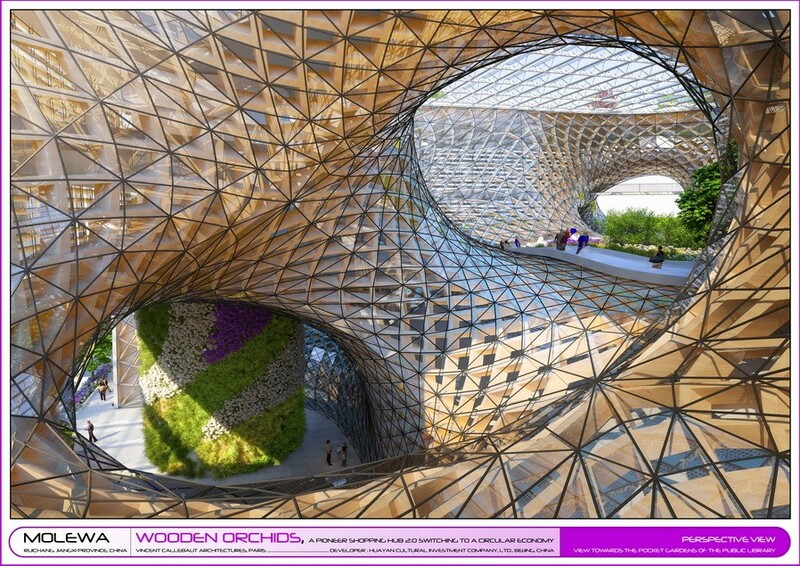 Based on biomimicry, the architecture of the shopping hub is directly inspired by the petals of orchids translated into minimal mathematic surface becoming the wooden structure module for the shopping complex. A minimal surface is a surface that is locally area-minimizing, and also a small piece that has the smallest area for a surface spanning the boundary of that piece. Particularly fascinating are minimal surfaces that have a crystalline structure, in the sense of a 3D repetition, in other words being triply periodic. 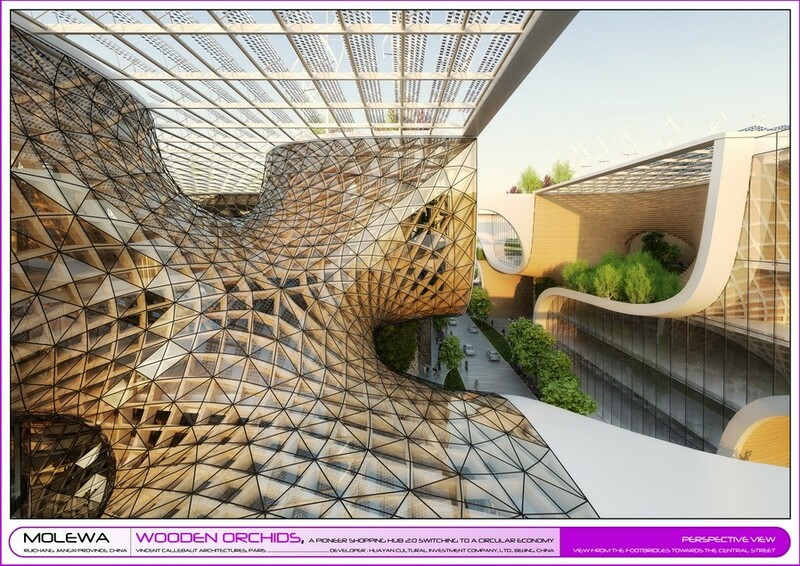 In the project, each petal of a surface presents a quadric rectangular tetrahedron as kaleidoscopic cell. 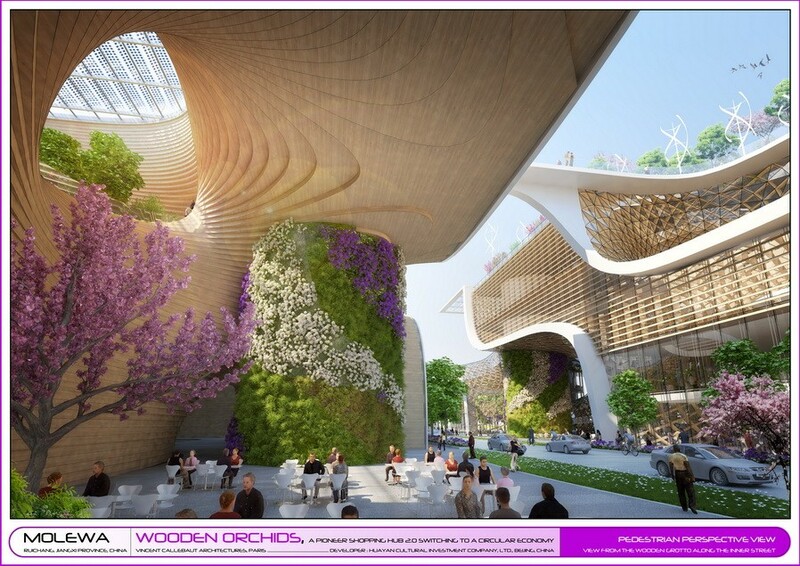 This prefabricated and standardized wooden petal - the basic module - is repeated in the space 16 times to create a complete orchid inscribed in a box, the ?wooden orchid box?. This initial ? wooden orchid box ? is 30 meters high, 40 meters long and 37.5 meters wide. Each plot of the shopping complex is created by 6 symmetric and/or asymmetric repetitions of this basic module. The 12 assembled modules form the whole project linked by footbridges above the East-West street. From this geometric and structural logic based on the ? 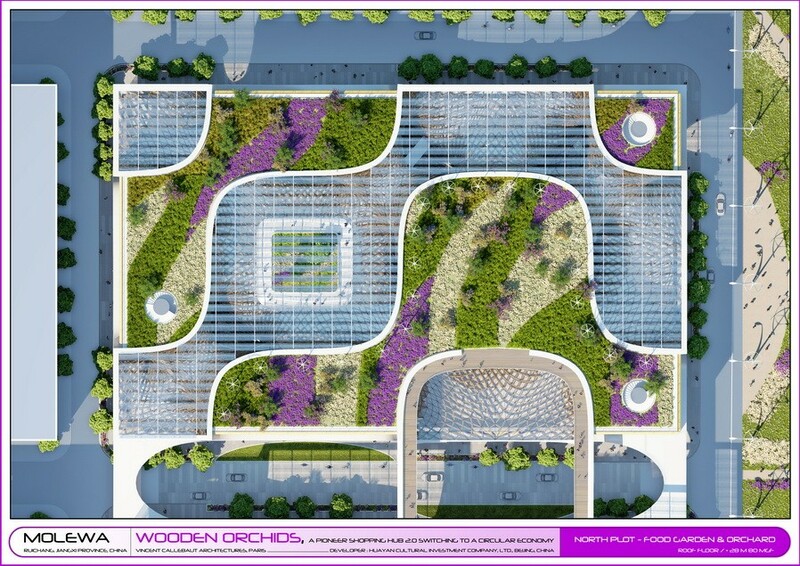 orchid box ?, the 2 plots are designed in two different ways: additive or substractive. On the one hand, the northern plot comprising the movie auditoriums, the public library, the physical exercise facility and the food services follows an additive architecture with solid facades and transparent minimal surfaces. 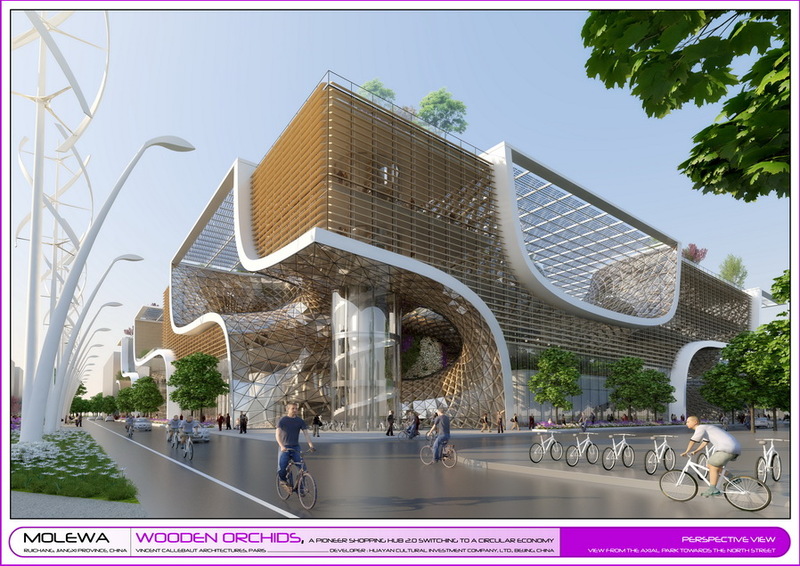 On the other hand, the southern plot integrating the 200 shops promoting organic foods , ecological products and farmers market follows a substractive architecture with transparent facades and solid minimal surfaces. The two plots propose a lot of open spaces conceived to allow for a maximum of light and natural ventilation. 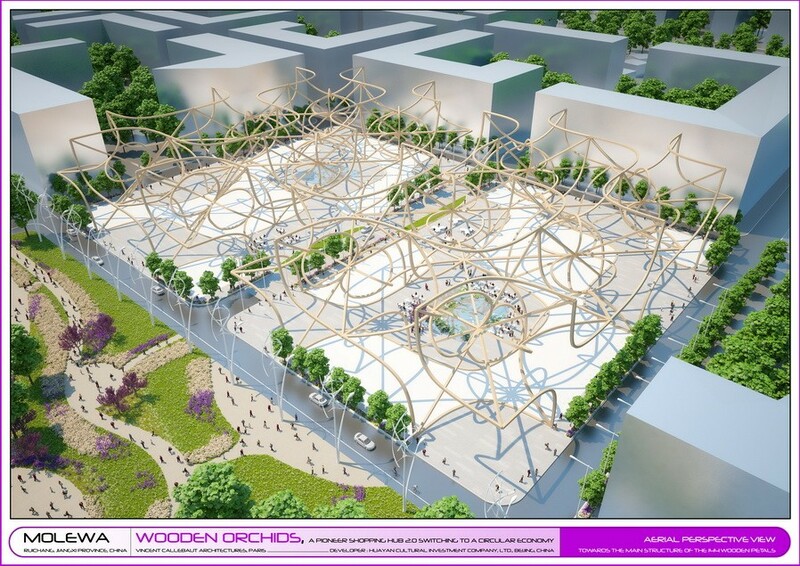 Rather than creating continuous perimeter buildings, the shopping hub illustrates how the external spaces could open out towards the street and the public creating a series of garden squares. 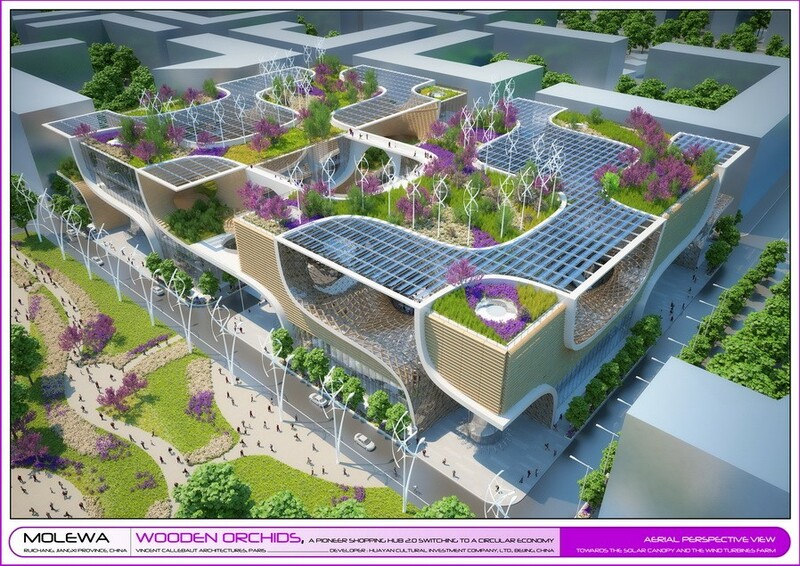 Each square of the shopping hub is different in identity and explores species, colours and biodiversity. Pedestrian and bicycle routes cross opened amenity spaces, which link the urban plots creating an informal network of circulation. The pocket parks and gardens are overlooked by strategically placed uses providing natural surveillance and allowing residents and visitors to spill out into the spaces. 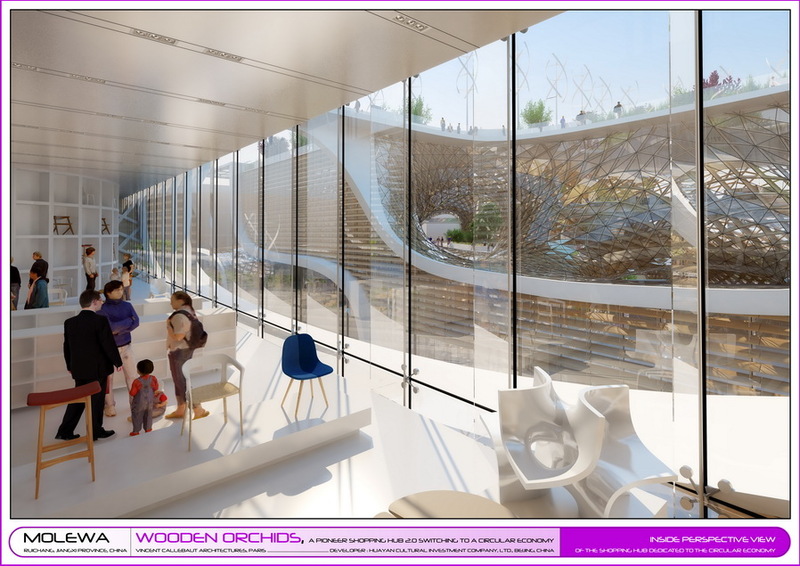 The resulting organic architecture aims at defining the landscape and built form together into a cohesive set which promotes harmony between human housing and the natural world through design approaches so sympathetic and well integrated with its site, that buildings, furnishings, and surroundings become part of a unified, interrelated composition.